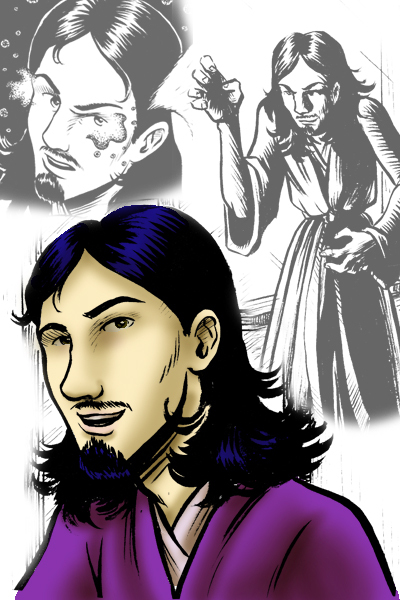 Baltazar Faramond is a Mage of the Violet Order, skilled in illusions, suggestion, and thought-detection. Originally employed by a powerful merchant-lord to ensure fair dealings with his vendors, Baltazar’s massive ambition soon leads him elsewhere. Steeped in the politics of merchants, mages, Covenant, and Shadow, Houses, Baltazar realizes that with his talents he can play many of the elements off each other to benefit himself. With his friends Odd and Zeke, Baltazar will persue his goals of power and riches, but not without a fair bit meddling from the crew Drake, Thel, Rhonwen, and Kamaria.